A great success for the first edition of Levanto Surf Festival, two days of boardsport focused on the international Rip Curl GromSearch 2016 contest, in which took place the only Italian tour stop. Due to the swell delay -which was expected to happen on March 28th- the first day had seen many side events, appreciated by all the visitors and young spectators who came for the surf contest restricted to U 18. 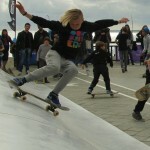 Under the spotlight, the surfskate contest arranged around the artificial woodwave Whitezu, a ramp very close to a wave and “surfable” with the skates made just for this sport. 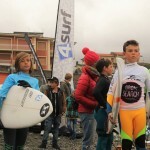 A prize was offered to all participants, but it was the young Sardinian Giulio Caruso to win the biggest award raffled for the first place by SurftoLive: a stay in at Playa de Somo. After a night spent with appetizers, parties and live music, the long-waited waves reached the amazing seaside of Levanto and the Rip Curl GromSearch contest could finally begin ! At north of Levanto’s bay, the “La Gritta” surf spot was chosen to host the event. The swell remained constant throughout the day, forming clean waves of half meter height and even more challenging sets. There were all perfect conditions to dispute every category. – Mattia Migliorini, once again indisputable Under 16 winner. Thanks to his victory, he is going to participate to the European finals. – Thomas Alfonso, who won the U 18 and got a chance to run in the Italian Fisurf championship. 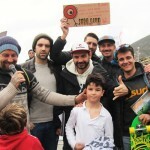 The awards ceremony took place in the Levanto’s Rip Curl Store. Alessandro Marcianò, big wave rider who came to prominence much abroad among the giants wave of Nazarè (Portugal), was invited as special guest. Special thanks to: Comune di Levanto, Capitaneria di Porto, Fisurf, Surftolive, Whitezu, all our collaborators, Rip Curl surfers Ale Marcianò and Filippo Orso, the photographers outside and inside water, filmakers, the association “occhio blu di Levanto” for his hospitality, 4surf and Surfcorner magazines, The Trixx, all exhibitors at the Surf festival, Lauretana, Smith, Citroen e Rip Curl Italy team.